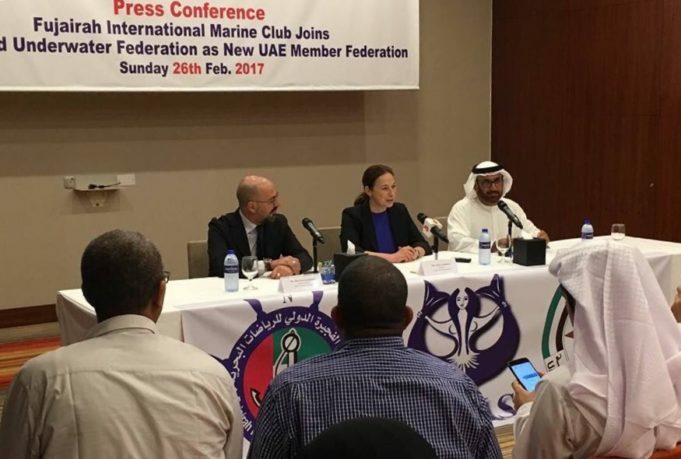 CMAS announces the joining of the Fujairah International Marine Sports Club (“FIMSC”) as new UAE member federation. The announcement was given during a press conference held on the 26th of February in Fujairah under the auspices of H.H Sheik Mohammed bin Ahmad al Sharqi, Crown Prince of Fujairah, and of H.H. Sheik Saif bin Hamad al Sharqi, Chairman of the FIMC. The press conference was attended by Major Ahmed Ebrahiem, FIMC General Manger and Mrs Anna Arzhanova President of CMAS, accompanied by CMAS legal advisor Mr. Riccardo La Cognata. Since its inception, FIMC has been committing tireless efforts in the development of a number of above the water and underwater sport activities and initiatives. The new membership represents for the FIMSC a step forward a 360° growth in marine sports and activities and for CMAS the establishment of an important and active presence in the UAE. Indeed, the Press Conference was the occasion to present the joint project of establishing a Marine Sports Academy and Training Center in Fujairah, which aims to develop marine and underwater activities and sports, such as apnoea, diving, finswimming, spearfishing and more. The Academy also pursues the scope of contributing in the education of young generations to the respect and preservation of marine environment with effective initiatives such as the Blue Helmets of the Sea, recently launched by CMAS with the scope of sensibilizing and stimulating people to clean and preserve marine world.